The Sentinel-2A satellite takes us over western India to a seasonal salt marsh known as the Rann of Kutch. One of the largest salt deserts in the world, the area fills with water during the summer monsoon season. During the drier winter, the vast white desert is a popular tourist destination, particularly for the Rann Utsav festival centred around a luxury 'tent city', visible in the central-right part of the image as a series of semi-circles. 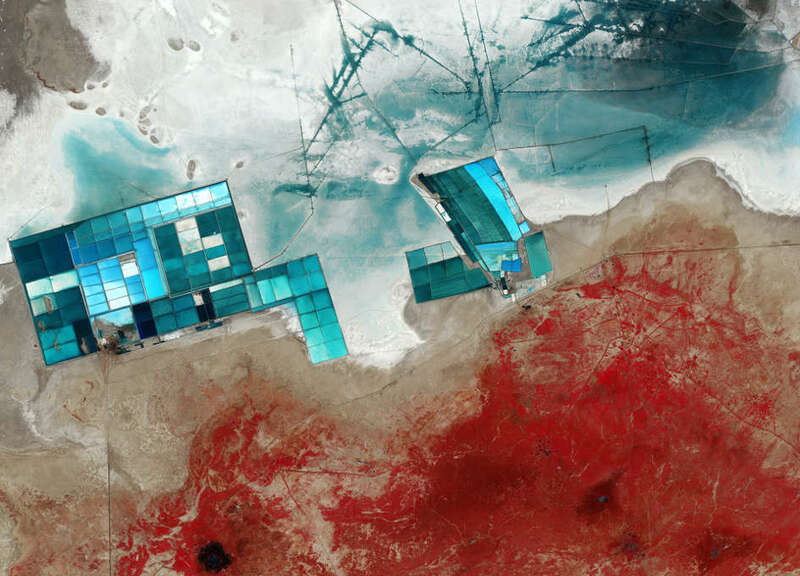 Large salt evaporation ponds dominate this satellite image. One of the major projects in this area is the production of potassium sulphate, which is commonly used in fertiliser. To give an indication of the size of these ponds, the width of the cluster on the left is nearly 13 km across. The lines in the upper-central part of the image are ditches used to control the flow of the water for the ponds. In this false-colour image, shades of blue in the pools and surrounding land come from varying mineral content, as well as the different depths of the pools. Meanwhile, vegetation appears red as seen in the lower part of the image. This area is the Banni grasslands, known for its rich biodiversity. The grasslands area was formed from sediments deposited by rivers including the Indus River, before an earthquake in 1819 changed its course. Today, Banni's vegetation is sparse and highly dependent on rainfall, but reoccurring droughts are increasing pressure on the arid region. Other factors, including overgrazing and the invasion of a non-native thorny shrub, are also stressing the environment. This image, also featured on the Earth from Space video programme, was captured by the Copernicus Sentinel-2A satellite on 16 December 2015.